Yuka Tsukagoshi is a poet and translator. She has a degree in English from Dokkyo University and studied Literature and Creative Writing at State University of New York, New Paltz. 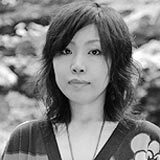 Her second collection of poems, Theatre Fury of a Border Crossing Mind, was published by Shichousha Press in 2010 and was a finalist for some of the most prestigious poetry awards in Japan such as the Mr. H Prize, the Nakahara Chuya Prize and the Japan Poets’ Club Prize for New Poets. Her first book, When Clouds Look Like Scrambled Eggs (Shichousha Press, 2008), was nominated for the Mr. H Prize. Her work has also appeared in several journals internationally including the U. S., Korea and Viet Nam. She is an editor and translator of the bilingual poetry journal Eki Mae. Her translations of contemporary haiku and free verse poems have appeared in journals and anthologies. She gives readings and often works collaboratively with visual artists in gallery shows and live performances. Judy Halebsky‘s book, Sky=Empty, won New Issues Poetry Prize and was a finalist for the California Book Award. Her second collection, Tree Line will be published by New Issues in 2014. Her chapbook, Space Gap Interval Distance won the Poets-Under-Forty award from Sixteen Rivers Press. On a fellowship from the Japanese Ministry of Culture, she trained in Noh Theatre and Japanese Literature in Tokyo for three years. The MacDowell Colony, the Millay Colony, and the Canada Council for the Arts have supported her work. Originally from Halifax, Nova Scotia, she now lives in San Francisco. She teaches Literature and Creative Writing at Dominican University of California.